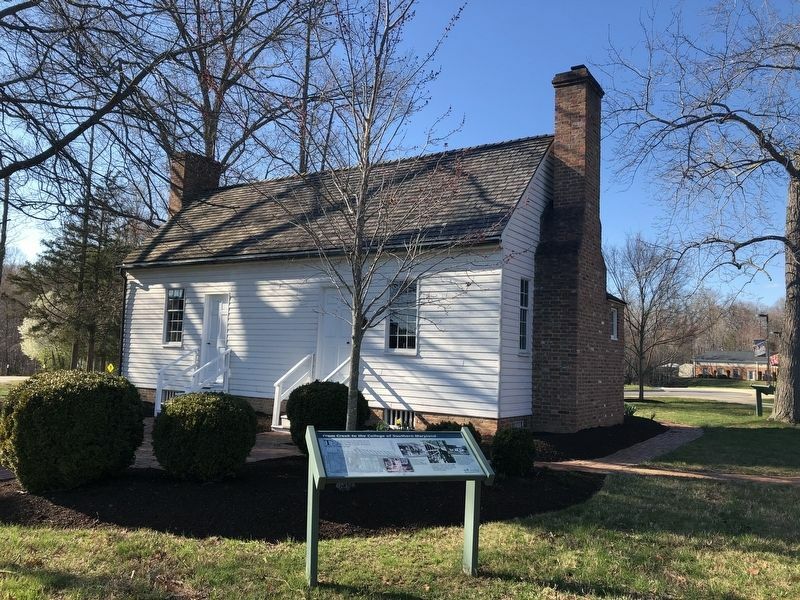 The structure known as Friendship House was rescued in 1968 from the Nanjemoy Creek site by members of the Historical Society of Charles County. Disassembly of the house was meticulous, with each piece of the structure preserved and methodically numbered. In 1976, Friendship House was lovingly rebuilt using original materials and old techniques on the College of Southern Maryland, La Plata Campus; which was then called the Charles County Community College. Saved for posterity, the house is furnished from private donations and funds from the Charles County Garden Club. 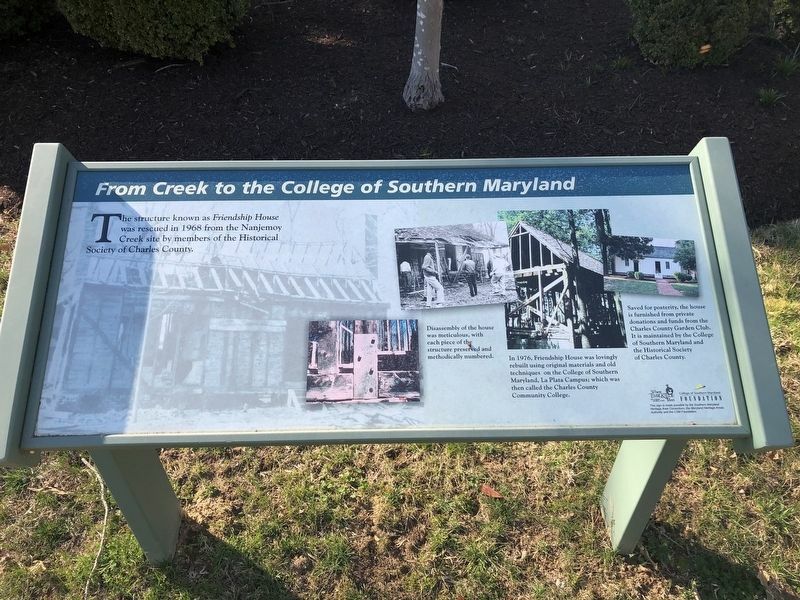 It is maintained by the College of Southern Maryland and the Historical Society of Charles County. Erected by The Southern Maryland Heritage Area Consortium, the Maryland Heritage Areas Authority and the College of Southern Maryland Foundation. west of Cross Campus Drive, on the left when traveling south. Touch for map. Marker is at or near this postal address: 8730 Mitchell Road, La Plata MD 20646, United States of America. Touch for directions. Other nearby markers. At least 8 other markers are within 2 miles of this marker, measured as the crow flies. Friendship House....one of Charles County's Oldest (a few steps from this marker); “The Monastery” (approx. 0.3 miles away); Thomas Stone (approx. 1.7 miles away); Church of St. Joseph (approx. 1.9 miles away); Charles County World War I Enlisted Military Memorial (approx. 2.1 miles away); Honor Roll (approx. 2.1 miles away); Charles County Vietnam War Killed in Action Memorial (approx. 2.1 miles away); Charles County War on Terror Killed in Action Memorial (approx. 2.1 miles away). Touch for a list and map of all markers in La Plata. More. Search the internet for From Creek to the College of Southern Maryland. Credits. This page was last revised on March 31, 2019. This page originally submitted on March 31, 2019, by Devry Becker Jones of Washington, District of Columbia. This page has been viewed 34 times since then. Photos: 1, 2. submitted on March 31, 2019, by Devry Becker Jones of Washington, District of Columbia.